You know that you are unique. No body is exactly like you. You deserve health care that is specific to your particular needs. Applied Kinesiology recognises this, and enables doctors to identify what is unique about you and your health problems, and find a solution that is specific to your needs. It recognises the body’s innate ability to heal itself, and realises that sometimes it needs help to function optimally and be in the best position to achieve this healing. Did you know that 80% of people suffer from back pain? Finding the causes of your health problems and determining your individualised care sets you on the road to recovery. Dr George Goodheart Jr. developed Applied Kinesiology, a new system of evaluation in Chiropractic, in the 1960’s. Through his remarkable observation skills and analytical mind, Dr Goodheart found that normal and abnormal body function could be evaluated using muscle tests. Health is dependent upon a balance between structure, body chemistry and mental well-being. These factors are evaluated using Professional Applied Kinesiology to determine a specific treatment programme. Professional Applied Kinesiology draws on complementary therapies of treatment, including: chiropractic, nutrition, meridian, cranial, rehabilitation, neurology, functional health care, and others. Applied Kinesiology (AK) can be defined as the clinical application of the study of movement and function. It uses functional muscle testing to measure the physiological response of a muscle to a specific force. With AK, muscle tests represent a primary feedback mechanism to examine how a person’s body is functioning. By using muscle testing as an indicator tool, the Applied Kinesiologist reveals imbalances in the body’s structural, chemical or emotional factors, and identifies how well a person’s body is functioning. It also allows the body to specify its preferences for treatment, and to prioritise certain issues or problems. In order to restore optimal muscle function, doctors may apply manual stimulation directly to the muscle receptors (mechanoreceptors) and other forms of treatment that may include precise chiropractic adjustments, clinical nutrition, dietary changes and other manual therapy procedures. In general, the doctor finds a muscle that tests weak and attempts to determine what is causing the muscle to function ineffectively. The practitioner then evaluates and applies the therapy that will cause the muscle to test strong and best help the patient. 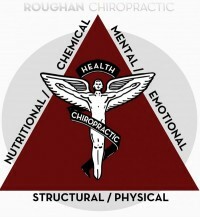 Applied Kinesiology uses the triangle of health model to explain health problems. The triangle of health is represented by an equilateral triangle with structural, chemical and mental health as its sides. When one or more of these factors become unbalanced, a person experiences poor health. Our health is largely determined by how well we balance the three sides of the triangle of health. Moving well, thinking well and eating well are the foundations for good health. Good food without fitness or sleep won’t make you healthy. Working out every day but starving your body of nutrition and rest won’t make you strong. Sleeping eight hours a night but not eating well or moving enough isn’t going to keep you bright-eyed and alert. But if you strive to do all these things consistently on a daily basis, you will be amazed at how your entire being responds to promote cellular growth, repair, and energy production, allowing all the body’s innate systems to function optimally. What will Professional Applied Kinesiology do for me? Help me live life to my fullest potential. Help identify my health concerns. Help restore my ability to function and thrive. Provide treatment and nutrition advice specific to my needs. If this approach sounds like something you would like to experience, call Roughan Chiropractic today.